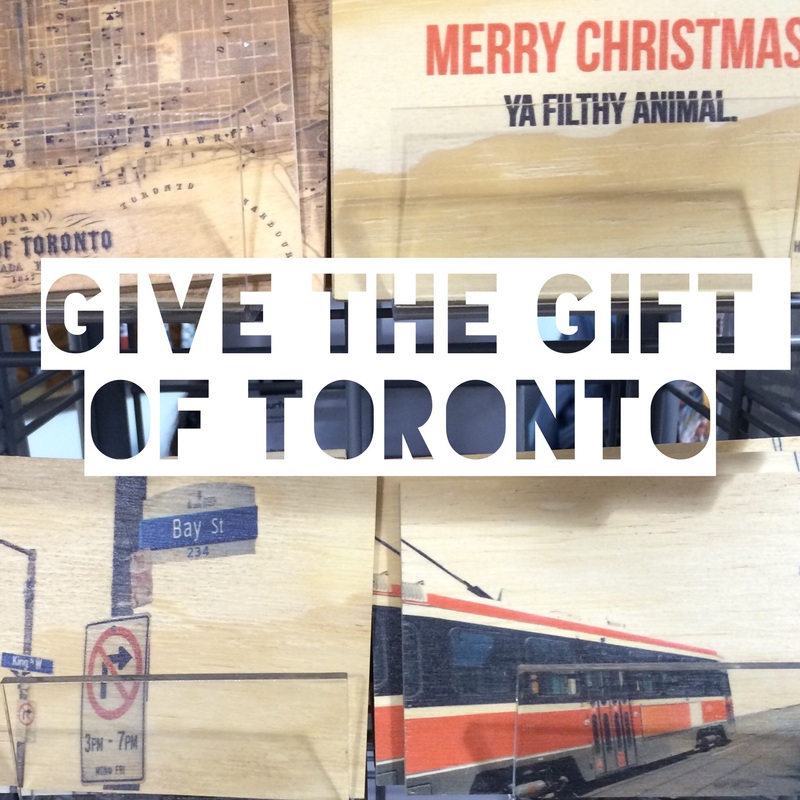 Give the Gift of Toronto | Kids in T.O. This year I am finding it difficult to find time to check out all the amazing markets and pop-ups featuring Toronto artists and artisans. They are literally everywhere from the mega gathering at the One of a Kind Show (you can still shop online) to the City of Craft (December 11 to 13 on Queen West) to the Holiday Market at Union Station (until December 20) — to name only a few. I’m in love with locally made. So this holiday season, I’ve been scooping up these amazing items that support our city’s creative and show off my love for the 6ix. The streets of Toronto: Walk into my closet and you’ll find many layers of Yasmine Louis. The westend print artist’s shirts and hoodies capture views from across the city. 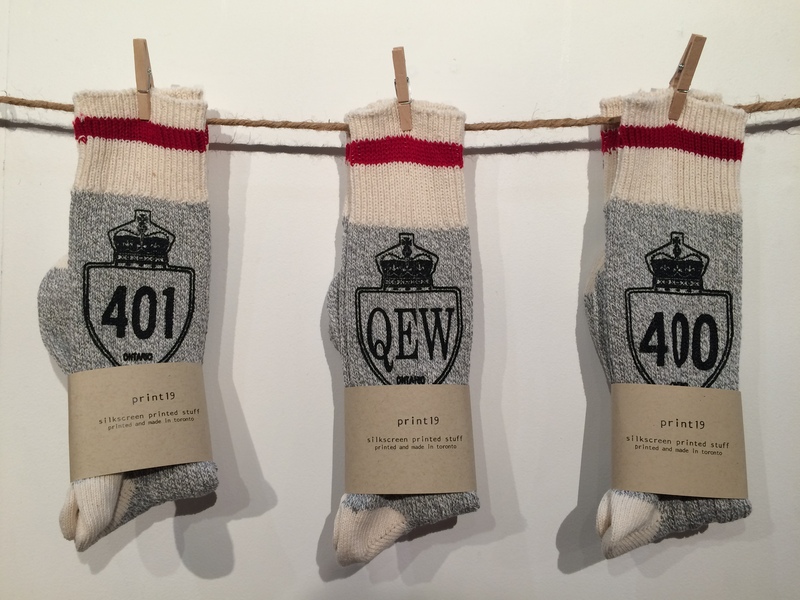 Her latest fashion offering – these cozy socks that pay tribute to our highways. 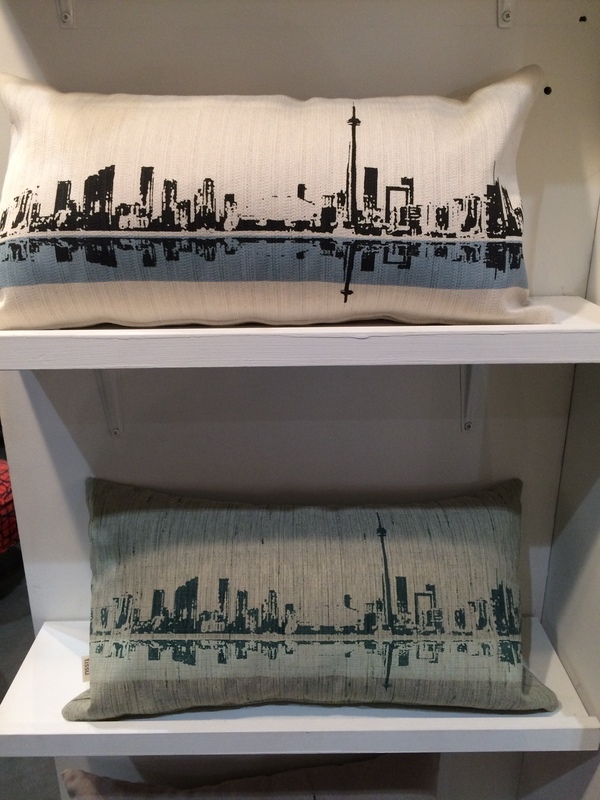 For a kid-friendlier view, we love this print that gives a shout-out to our CN Tower and the Red Rocket. It’s a snapshot from their latest app Sago Mini Superhero. The Skyline: Our iconic skyline has inspired many an artist. For your tush, Foutu Tissu (from Montreal) does a gorgeous ottoman and pillow and the Candi Factory has added these hot pink undies to their repertoire. For your wall, you’ll fall in love with the creative license plate art by Route 401. In addition to the map of Canada, he makes T.O. proud with a cool skyline, as well as our home team. The map: These artists give us a couple of ways to appreciate the shapes and angles of our city. The Toronto coasters and trivets by the National Design Collective are subtle and so stylish. The Tree Tour Maps by Torontonian Marlena Zuber (remember when she collaborated with CBC Radio Metro Morning’s map of Secret Toronto?) For the nostalgic, this eastender County Cupboard turns vintage maps into artful pillows. The Streetcar: Much of artist Wendy Tancock’s work features iconic Canadian. You can find the TTC Streetcar on mugs and tee’s. (Spotted a baby onesie and this kid t-shirt at Labour of Love in Cabbagetown.) 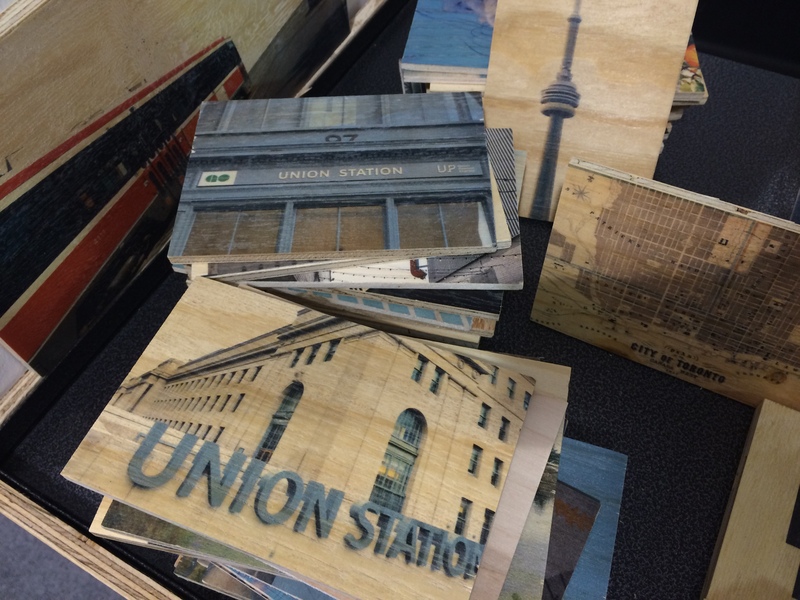 The women behind Resurfaced create wood posters, coasters and postcards (that you can actually send in the mail.) Into other T.O. icons? We also love these kid Tee’s by the Toronto-based duo from Cry Wolf Clothing on Ossington. The Hoods: The Tuck Shop Trading Co makes it easy for you to rep your hood. Their gear is found all across the city. (One of our faves is the Good Neighbour in Leslieville.) They have toques for big and small noggins (infant size below.) If you want to frame your favourite hood, Toronto illustrator Dave Murray has put Toronto’s neighbourhoods in words with his mapping series. 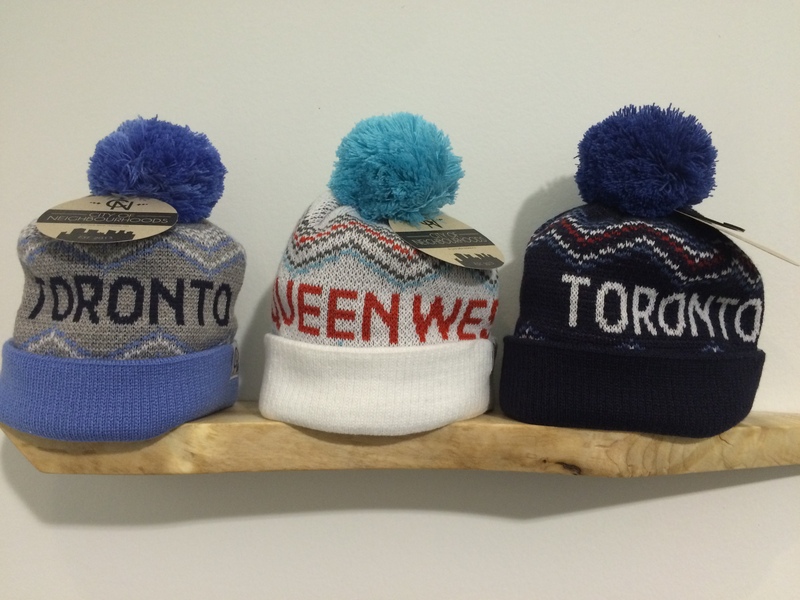 Infant toques by Tuck Shop Trading Co.